It’s December and the holiday season is here! The holidays are the perfect time to show off your maker skills with handmade gifts and decorations. However you celebrate, if you’ve got a Maker in your family, you’ll want to incorporate some of these activities into your festivities. Below are a dozen fun, inexpensive activities the whole family can make together. These are super cute and super easy cards to make with decorative tape and a few other materials. Lay a vertical strip of washi tape for your trunk. Build out your branches with skinny, black print washi tape (you can cut your washi tape down the middle to get these skinnier pieces). Scarf: Lay a piece of washi tape from the left side of your card to the right. Cut out 2 circle shapes from a strip of washi for your snowman’s buttons. Cut out an orange triangle shape for your snowman’s nose and glue it down. Add your googly eyes above your carrot nose. Draw a simple smile shape with a black pen. 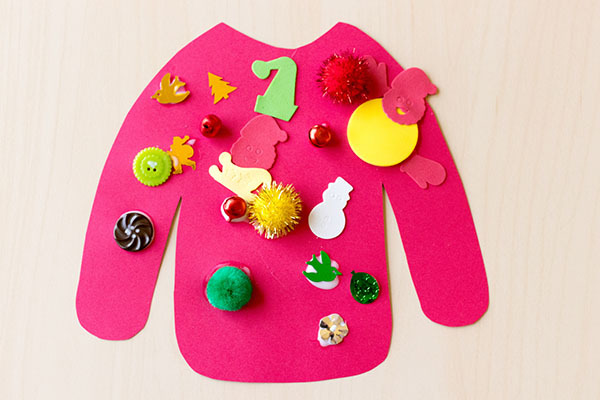 This festive greeting card is really easy to make — no sewing skills required. Check out the website above for step-by-step pictures & directions. Cut 2 or 3 different-size stars from fabric or decorative paper. Glue together. Cut 7 to 10 1/4″ slits on the bottom left-hand half of card, spaced 1/4″ to 1/2″ apart. Punch a hole about 1″ in from top right corner. Insert thread through hole, and wrap over the front of the card, securing string inside first slit; repeat until all slits are threaded. Trim and knot ends together. For those who want to take their card making to the next level, add some led lights. Let your imagination run wild with all the images you can light up once you get the hang of making a complete circuit. You can draw your own pictures, use stickers, or cut out images from magazines to decorate the front of your card. What you’ll need: cardstock paper, glue, foil, tape, brass fasteners, led lights, & a 3v battery. Made from clothespins, these graphic rings are terrific for kids and parents to do together. The best part: You can hang them up and admire them for years to come. Start with wooden clothespins (available at the Dollar Store, Target, Amazon). Apply strips of washi or other patterned tape (available at craft stores like Michael’s or Joann’s) to one side of each pin (smooth it right over the groove that holds the metal spring). Trim the edges of the tape with small scissors. Discard the outer rings from embroidery hoops (we used a few sizes, ranging from 4 to 7 inches) and clip on the clothespins. Hang the wreaths with nylon thread or ribbon. Draw a sweater or trace the sweater template on the cardstock. You can also just print the template directly on to the cardstock ,then just cut the sweaters out. Put all of the supplies in a tray with separate compartments for easy access. This quick video from the School Library Journal shows how to make a Christmas tree tabletop decoration from a magazine- reduce, reuse, recycle! This scrub from the Jacolyn Murphy website makes a great gift for anyone who wants to keep their skin glowing all winter long. Mix together white sugar, olive oil, coconut oil and peppermint extract or oil in the amounts described in the website linked above. Add food coloring and mix to desired color. Layer in pint jars and decorate the jars with ribbon and candy cane. Change it up: Check out Murphy’s post to change the colors and scents of the scrub. Or make one without scent or coloring, decorating the jar with a special holiday ribbon. Kids can take an old sock and give it new life by turning it into a reusable sleeve for coffee or hot cocoa to go. What to do: Cut 4 inches from leg of sock to form a cup cozy. Add embellishments using fabric glue. These pretty pens from the Sew Sara blog are a go-to gift for teachers and students, and a fun project for beginning sewers. Check out the blog post for step by step instructions. This activity is best for kids 8 years and up. For each pen, measure two strips of fabric (one measuring 3 1/2 inches x 13 inches, and one measuring 3/4 inches x 13 inches). Wrap the pen with the narrower strip of fabric and glue in place. Create and sew a pom-pom from the wider strip according to the directions on the blog post and glue to the pen. Change it up: Wrap the pen in duct tape, and/or add a flower instead of the fabric pom-pom. This is a great gift for all the people in your life who love to bake or who love to eat cookies! Add sifted dry ingredients from your favorite cookie recipe (or the recipe from the link above) to a clean, dry Mason jar. Press each layer firmly into the jar. Add a pop of color to the top with holiday-themed candy sprinkles. Print out the tag from the blog post or make your own if you’re using a different recipe and decorate the jar lid with felt and buttons. Wishing you and yours a happy handmade holiday! July 10, 2017 – Everything goes by Sea! Build a sea-worthy vessel of your own imagination. Will it sink or float? Listen to a book then try for yourself. July 24, 2017 – Toddler Runway! Design an outfit for a cut-out doll that is totally you. From high-art fashion to practical stand-bys, show us your fashion chops. July 27, 2017 – Build! Legos, Kevas Planks, Straws and More!